Marvel really seems to have hit its stride with Phase 2. Most importantly, it’s learning from prior mistakes. As with Iron Man 3, Thor: The Dark World is very much its own film, not just a stepping stone on the way to Avengers: Age of Ultron. Thus, it isn’t overburdened by the presence of the other heroes and any meta arc taking place stays firmly in the background, where it belongs. This time around, Thor’s been keeping himself busy trying to get the nine worlds to all get along and recognise the authority of Asgard. We get some glimpses of the other worlds – of course, we’ve already seen Midgard before – but none of them are particularly awe-inspiring. In fact, the so-called ‘dark world’ is probably the least impressive of them all. 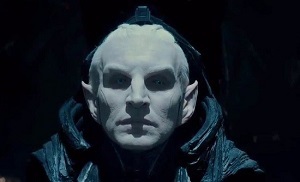 After some slightly awkward and very Lord of the Rings-ish introduction, it becomes clear that there’s an ancient evil brewing in the form of Malekith (Christopher Ecclestone) and his race of dark elves, so before long Thor’s got his work cut out for him saving not just the world, but all the worlds. This has to be the best-looking Marvel movie yet. Whilst all the previous ones have been merely satisfactory in the visual effects department, it seems that a lot more money has been thrown around here. Despite the occasional dodgy greenscreen moment, The Dark World looks fantastic. Even The Avengers didn’t look as flashy as this. I avoided the 3D, as I often do, and others might wish to do the same. As with the first Thor, there are several under-lit action scenes, and I have a feeling that the high octane moments would be hard to follow in stereo. Take a moment to consider the cast. You’ve got Chris Hemsworth and Natalie Portman. Fair enough. But how often do you see a supporting cast list like this: Idris Elba, Kat Dennings, Christopher Ecclestone, Ray Stevenson, Anthony Hopkins, Stellan Skarsgård, Chris O’Dowd, Tom Hiddleston, Rene Russo and Jaimie Alexander? It’s the kind of line-up that reminds you of the 90s Robert Altman films, and testament to the security that the Marvel movies must offer actors, who normally never know when their next gig will be. Alas, Portman still doesn’t have much to do in The Dark World, apart from get into trouble and need saving. If the rumours were true about her trying to get out of her contract, I wouldn’t find it hard to believe. You’d think, with Joss Whedon on his throne at Marvel Films HQ, that the female characters would at least get a chance to shine. Here, not so much. We see more Dennings this time around, which is scientifically proven to make any film better, so there are still certain things to be thankful for. The Dark World loses traction somewhat in the second act but by the time the climax comes around, you’re in for a real treat. Taking a single idea to extremes, the final action scene is a thrilling and clever piece of filmmaking. It’s also nice to see a Hollywood blockbuster utilising a city that isn’t New York, London or Tokyo. The are some fairly major plot holes – the Marvel films aren’t known for their water-tight scripts, after all – but it doesn’t really matter when you’re having this much fun. If they’d given Portman something more useful to do, and perhaps made Malekith and/or his motives more interesting, then this would have been an A-class comic book movie. Instead, it’s certainly better than the worst of Phase 1, but doesn’t come close to The Avengers or Iron Man 3. This entry was posted in Film Reviews and tagged Action/Adventure, Comic Book, Fantasy, Science Fiction by Stuart Wilson. Bookmark the permalink.